Yes, I mean a real, beginning-to-end marine-rated cell booster. This Super Halo from Shakespeare is completely designed for marine needs. It will help you get great reception from further than you ever thought possible. Land-based cell towers are designed to go no more than about 1.5 miles in any direction. If a tower is near shore it could go further because there’s nothing between you and the shore to block the signal, but if you’re looking to go furter than that, you need a marine cell booster. You won’t get service once the tower is over the horizon, but initial testing seems to show that you’ll get great reception in areas where your phone went dead before. The Shakespeare Super Halo will give you voice and data service and integrates with the rest of your marine electronics. The antenna and outdoor connections are designed to survive the harshness of marine life and the extra output power of this booster is designed to get great service into all parts of most vessels, even if they have layers of varnish on the walls or metal partitions, both of which block weaker signals. I understand that these boosters aren’t for everyone, but if you’re outfitting a luxury craft, this is the sort of investment you’ll want to make. You can feel confident that this booster kit was designed with the marine world in mind from the beginning. It’s not just a land-based booster with a marine antenna tacked on. 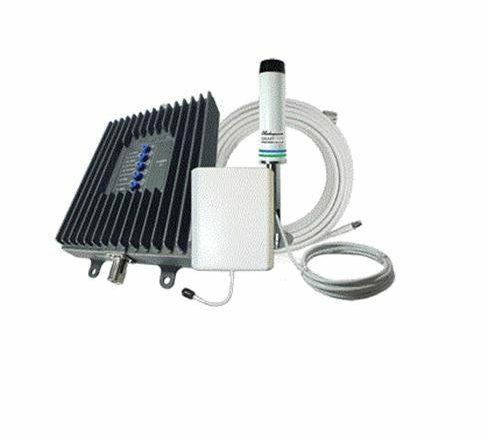 Shakespeare, which is one of the best-reviewed names in marine antennas, partnered with one of the nation’s leading manufacturers of cellular boosters to create a kit that completely addresses the needs of most yacht owners. If you’d like to talk about this cellular booster or any of the other ways that you can upgrade your vessel with the latest radio, satellite, television, cellular or streaming options, you’ll really love the folks at Signal Connect, the professional sales arm of Solid Signal. Our specialists have outfitted some of the largest and most lavish vessels on the water today and we’re ready to help you get yourself all set up. Give us a call now at 866.726.4182 and we’ll show you how easy it is to make sure you leave nothing behind when you shove off! Yes you have to register your cell booster. At least for now.